Biblioteca Medicea Laurenziana – These aren't gray hairs, these are highlights! If I have a religion (used in the sense of “an interest, a belief, or an activity that is very important to a person or group”), it is that of the book. It’s not just that I love reading, but that I respect the knowledge and imagination that are captured in books. As a result, libraries are special to me, especially old ones that, by their design and embellishment, emphasize how precious books were at a point in time. I feel a sense of reverence akin to that felt when entering a church, as I did when I visited the Biblioteca Medicea Laurenziana. The library’s core collection consists of manuscripts obtained by Cosimo de’ Medici (1389– 464), which were added to by Lorenzo de’ Medici (1449-1492). Michelangelo (1475-1564) was hired to design and build the library, although others eventually took on some of the work of realizing his designs. The entrance hall is pleasingly symmetrical and emphatically vertical in its architectural elements. It features a staircase designed by Michaelangelo; a term new to me was ‘pietra serena,’ the gray standstone of which it was built. An unusual feature of the staircase is that the central steps are ellipses. The central section of the entrance hall staircase. At the top of the staircase, one enters the glorious Reading Room. In contrast to the entrance hall, this room is horizontal in form. 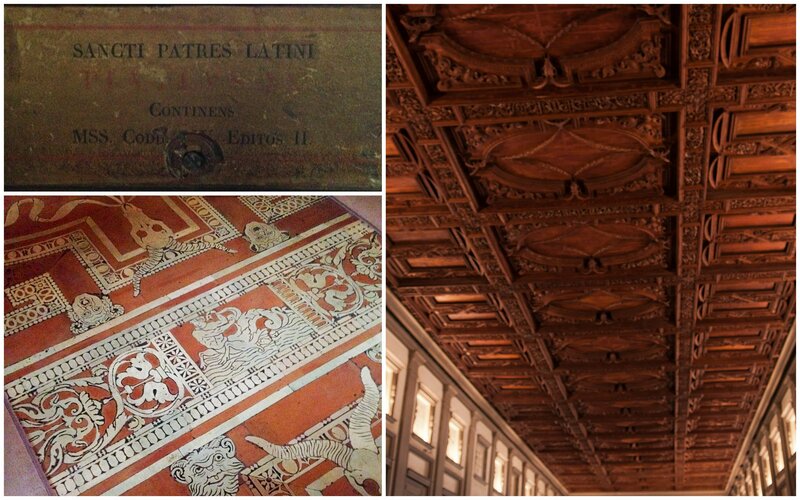 The ceiling is of wood and the floor of terracotta, both featuring motifs related to the Medici family. My favorite part of the room is the carved benches that combined the functions of lectern and shelves. The manuscripts and books were organized by subject (did my library-geek heart good to read that) and stored either on the lecterns or the shelves underneath, with the contents of each enumerated by wooden plaques on the end. The manuscripts are no longer in the Reading Room – they are housed in vaults in the library – and the books were given to the Biblioteca Nazionale Centrale di Firenze. In the Reading Room, clockwise from top left: label at end of bench; ceiling; segment of floor. A bonus to my visit was the exhibit in an adjacent room, called “La Forma del Libro” (The Shape of the Book). It was fascinating to see writings on ostraca (potsherds) that dated from the second century AD and follow the development of the written word from papyrus to parchment to paper and from scroll to codex. It’s interesting to see in these ancient writings not only poetry and stories and religious writings, but mundane things like receipts from the public granary or instructions on how to layer vines. These everyday details make me feel connected to the people who came before me. Among the beautifully illustrated books and scrolls, there was a Japanese scroll from the 19th century that depicted a phallic contest. According to the exhibit label, this was a common motif of Japanese humorous erotica. I could tell when people reached this scroll because they started laughing! One of the best parts of my visit was seeing other people as fascinated by the Reading Room and the exhibit as I was. I found it reassuring somehow to know that other people cared too about libraries and books and the history of the written word.